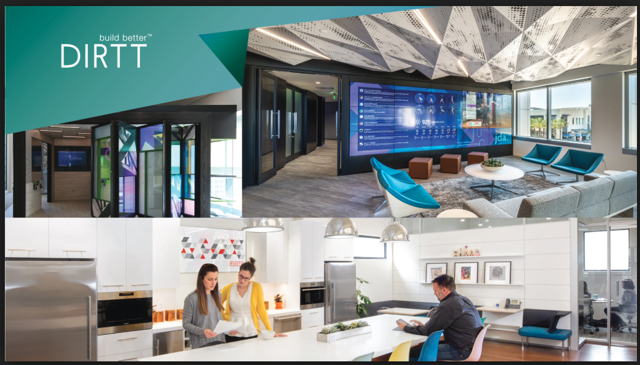 Dirtt Environmental Solutions share prices have increased 28.8% since year-end financial results were reported and will continue to be in the spotlight prior to its anticipated Nasdaq listing. DRT's strong positioning in an under-penetrated market and exclusive line of products will continue to reap the rewards of increased sales complemented by a cost-effective business model. As an overlooked stock bolstered by a business model characterized by numerous competitive advantages, DRT represents a tremendous buying opportunity for investors looking for real value. 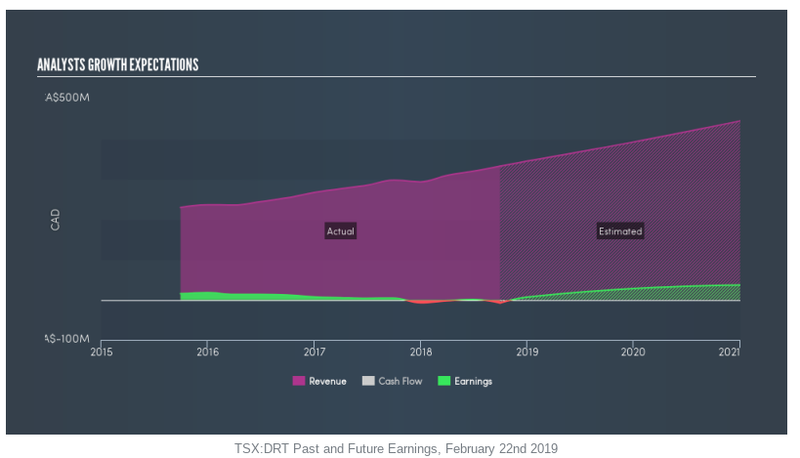 Dirtt Environmental Solutions Ltd. (TSX: DRT and OTCPK:DRTTF) has skyrocketed 28.8% since the release of the company’s year-end financial results on March 20, 2019. What’s behind the most recent rise in DRT’s shares? To start, three months ago the company announced a significant leadership change in an effort to scale the firm’s efforts in fueling sustained and profitable growth. This seems to have struck a chord with investors who have experienced rapid growth in returns since the announcement. As an under-the-radar stock with a market capitalization of just $600 million, DRT is poised for a significant up-rise and will likely be accepted favorably by Wall Street when its anticipated NASDAQ debut in the later half of 2019 comes into fruition. The company’s strong business model and specialization in such a niche market present tremendous value for shareholders who should buy in at the $9.10-and-under range as shares increase to a minimum of $10 by year-end 2019 and $11-13 by year-end 2020. Designs, manufactures, and installs customized prefabricated interiors. Combines proprietary novel 3D design, configuration, and manufacturing software (NYSE:ICE) with in-house manufacturing of its prefabricated interior construction solutions and its distribution partner network. DIRTT Walls: customized interior wall solutions supporting integrated technology. DIRTT Power: pre-tested adaptable power solutions arriving on-site to customers at the desired lengths with integrated factory components to eliminate waste and provide future adaptability and flexibility. DIRTT Networks: pre-fabricated, pre-tested, componentized approach for building sustainable network infrastructure. DIRTT Millwork: customized modular cabinetry for various sectors including healthcare, corporate, education, hospitality, and residential. DIRTT Ceilings: prefabricated custom ceilings for noise-reduction and speech-privacy. DIRTT Timber: cross-laminated timber and glulam timber solutions. Indeed since the company’s inception in 2003, DRT has grown rapidly and now serves the global market in various industries including commercial, education, healthcare, government. retail, hospitality, and residential. Investors familiar with the construction industry understand that it can be quite mundane, so how does DRT position themselves to not only serve a niche market, but in a way that outpaces their competitors? The answer lies within DRT’s advanced technological capabilities essentially rendering the company as a quasi tech/construction player serving specialized markets looking to abide by growing environmentally regulations and an overall increased demand of environmentally-conscious consumers. Perhaps the most key feature of DRT is its iconic ICE platform consisting of its own 3D design, configuration and manufacturing software that seamlessly integrates and merges virtually every step of any given construction process. Top performers in the construction industry are able to meet their timeline goals precisely all while managing financial instability in order to effectively forecast budgets, ultimately leading to stable shareholder returns. Another source of competitive advantage derived from the ICE platform is its ability to stabilize costs in the construction labor market. The ICE platform achieves this by automating the entire building process and therefore providing cost-relief in a constrained labor market characterized by a shortage of skilled workers. The ICE platform provides a unique capability for DRT and is a key selling feature for investors who are considering the firm's competitors that continue to experience costly building processes, budget overruns, and lateness in abiding with forecasted timelines. Bolstering this, DRT’s technological capabilities have been safeguarded with over 218 patents that will continue providing the company with ample room in designing even more effective designs to further the gap between themselves and their competitors. As evidenced by the graphic above, sales currently stand at CAD $356.68 million and have rapidly grown at an approximate annual rate of 20% since 2013. The exceptional pace of revenue growth is due to the rising demand of the under-penetrated market DRT has specialized in. As climate change continues to dominate the news agendas of journalism and investing outlets, along with the agendas of politicians, demand for environmentally-friendly products and services will continue to increase and outpace supply. Therefore, DRT’s target of environmentally friendly buildings and spaces places the company in a prime position in supplying this rising demand and profiting substantially from the $150 billion market. Finally, it’s important to note the most recent management changes that will continue to optimally calibrate DRT along its sustainable and profitable growth trajectory. Prior to the following management changes, DRT welcomed a new CEO and CFO to pursue the company’s commitment to international expansion. Geoff Gosling, co-founder of DIRTT and the visionary behind DIRTT’s current line of solutions, was placed as Director of Innovation. The Chief Operating Officer position will be temporarily filled by Jeffrey A. Calkins, who previously served as the principal of interim management and consulting firm Manufacturing Resources Inc.. DRT has also opened up a Chief Commercial Officer position which they plan to fill accordingly with the most qualified candidate in the coming months. Regardless, the opening of a new COO and CCO position complemented with Geoff Gosling’s promotion to Director of Innovation indicate expansion for a company that continues to reap the rewards of an under-penetrated market. At an EBITDA of $37.6 million, DRT trades at only 15X this amount which would classify the company as a tremendous value opportunity among many Wall Street analysts. This will be further complemented by the company’s new CEO and CFO committed to improving free cash flow and EBITDA margins. Annually, net income also increased from a $7.4 million loss ($0.09 loss/share) in 2017 to a $3 million gain ($0.04/share) in 2018, a feat rather impressive given the $20 million impairment charge and $9.6 million reorganization expenses factored in. Revenue increased 22% from $293.4 million in 2017 to $356.7 million in 2018. By next year, analysts have forecasted DRT’s sales to increase over 22.7% to an average estimate of $436.81 million. Estimated earnings potential has also been significant revised upward as investors and analysts continue to price in rising demand and consumer expectations. DRT illustrates a simple case of supply and demand both from an operational and investing standpoint. On the operations side, increased global environmental regulations and demand for environmentally-friendly services and products complemented with a booming construction industry will continue to drive growth for DRT and its sound business model. The Canadian-based company has achieved roughly 80%-85% of revenue from the United States which backs up their reasoning to move forward with preparation for an intended U.S. listing in 2019. This move will surely increase demand from not only American investors, but foreign investors who gain further insight into the operations and business moat of the company. Don’t make the fatal mistake of overlooking DRT as the company continues to automate the construction industry. At a price of $9.10 and below, this is a tremendous opportunity as analysts continue to revise stock projections to at least $10 by the end of 2019 and towards the $11-13 range as shares gain traction on the NASDAQ exchange by the end of 2020.